Snook are found from central Florida south, usually inshore in coastal and brackish waters. They are also common along mangrove shorelines, seawalls, and bridges. They can also be found on the nearshore reefs, jetties and in close along the beach. In our region of the Indian River Lagoon system we are geographically located at the northern edge of their range. On extremely cold winters our snook population will die, and then repopulate and grow over periods of warm weather. 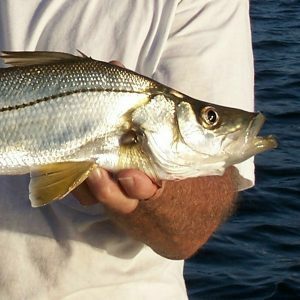 With that said, anglers specifically targeting snook should begin their quest from the Sebastian Inlet south on Florida’s east coast. Snook congregate in large schools during summer in deep passes and inlets to spawn. Snook begin life as males, but between 18 and 22 inches long some become females. Spawning occurs primarily in summer. Snook school along shore and in passes during spawning season and feed on fish and large crustaceans. Like most fish, snook orient themselves to face moving water and wait for prey to be carried down the current. Snook often jump clear of the water, and provide long powerful runs once hooked. They take a large variety of lures based on water conditions. Use live pinfish, small mullet, and shrimp, free-lined or fished off the bottom with a fish finder rig. Snook have razor-sharp gill plates, so be careful when handling them and they make excellent table fare when caught within their slot limit of 28 to 32 inches and within their season.